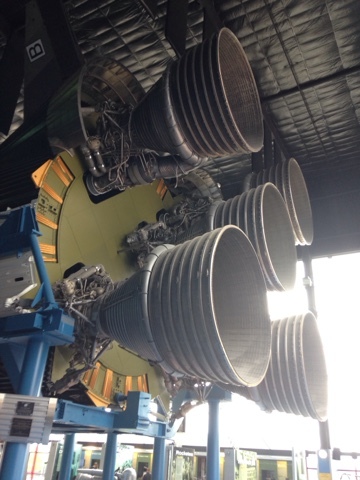 The Huntsville Space Center has been something I wished to go to for a long time. Being that I would be only a little over an hour away while at the SE GTG, I knew it was my chance to go. When I say I have wanted to go for a long time I am not exaggerating so my expectations were high, and that is not always good. My arrival was about 10:30 am and all was good including the ride over and through the city. As I was driving to the center the parking was on the left and for some reason it was all coned off except the handicapped parking. I drove down the drop off road to the main entrance wondering if today thebplacecwasnt open. I see someone with the site uniform on and got out and asked about parking. She said I needed to go past the building to park. Clairvoyant I'm not, and I was a bit frustrated that they could take the time to close off the parking, but couldn't put up a sign pointing to alternate parking or have someone direct the visitors that were arriving. I parked and went inside to pay entrance. There are 3 things you can pay for. 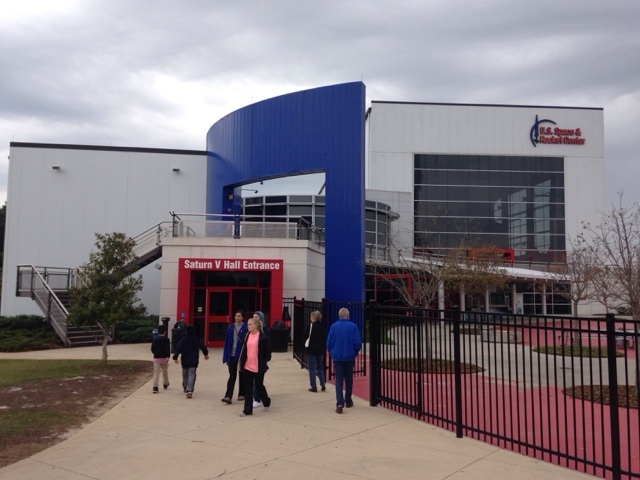 Entrance to the site and buildings, IMAX theater, or bus tour of the space center. I purchased the ticket for entrance at I think $22 and I thought that the bus to the space center down the road would be good at $15. I had about 1.5 hours to look around before the bus tour that occurs only once a day at 12:30. I was given a map of the site and started out through the doors I was directed. Then it became confusing as there is no logic to how to transgress the various exhibits in that first building. The map was generic as to location but the multi-levels, ramps and stairs and some are blocked off made it frustrating. 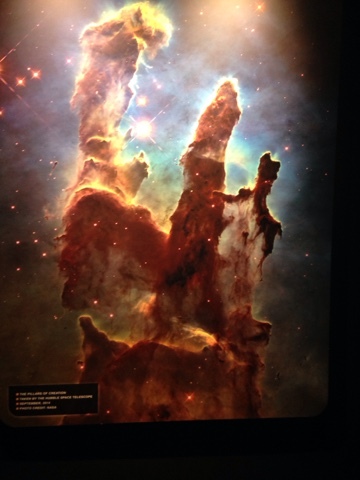 I found myself eventually looking at the pictures above and below that were amazing images from outer space using the Hubble Telescope. I was glad I finally found something of interest. I walked through a large exhibit of jewelry that were labeled in a way to imply they had space designs but looking at them I saw nice jewelery but didn't see the connection to how this got billing to be here. There was no one to ask. 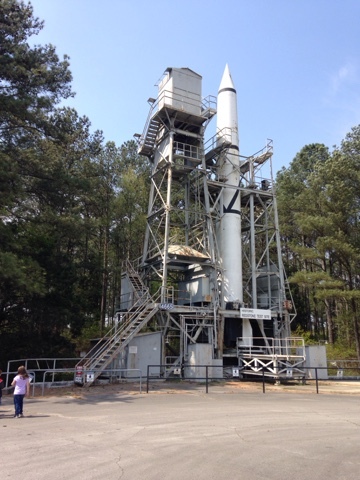 I finally got to a dead end in the maze of rooms and I went out an exit door to the back of the building where the rockets in the first picture reside. This is also the amusement ride area that doesn't appeal to me, but the school kids there were having fun. One was the g-force spinning thing and another was you sit and are pulled up a tower and dropped. I make my way over to this building where there is some connection to Nationsl Gepgraphic. I walk in and there are no signs on where to go to the exhibits. I see a theater entrance on the first floor so I suspect there may be a film but there is no listing on what or when. I head up these large stairs to a large hall with a full size Titan Rocket that you can't get in one picture. 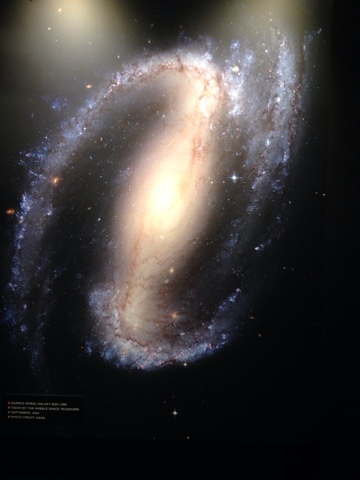 My spirits were up to be looking at real space stuff. Along the outside wall of this very large room were many displays and timelines of the space program. On the inside wall of the very large room are more interactive displays. There were older men in white coats seeming to give mini tours but there was no way of knowing how to get one and they were busy and unable to ask. I was guessing that they may have worked for the space program at one time. It was getting close to noon and I needed to start heading to the bus tour at 12:30, so I went outside and wondered over to the other side of the first building where there is a full size space shuttle. There was another smaller building in the back by the shuttle but I could not tell if it was open as workers on a hydraulic lift were working above the entrance and although it was not coned off, I wasn't about to walk under the workers when they were working. When you buy your ticket for the bus they don't tell you that you need to be a few minutes early and you need a government ID. I was early and had my ID. Your name when you bought your ticket and ID need to match and they keep this record so they can get on to the NASA Space Cebter area a few miles down the road. An armed security guard comes on the bus as we enter the gate to check the records. 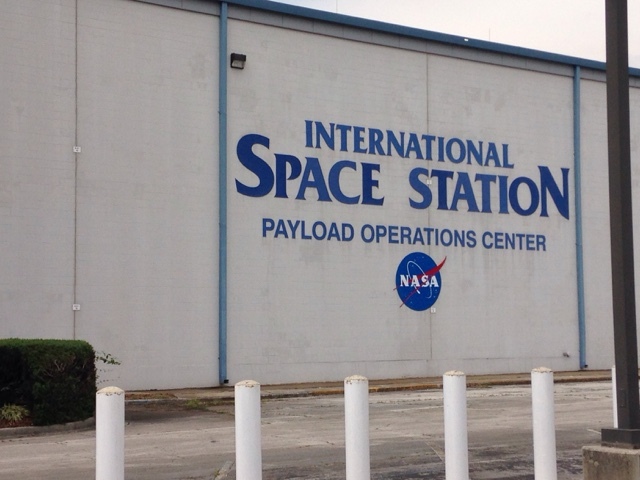 Our first stop is this building above where we go in on the first floor for orientation and then climb stairs to the mission control center for payload operations. The current mission being monitored is the International Space Station and the room is manned 24x7. There are status boards and we are told about all the seated jobs. 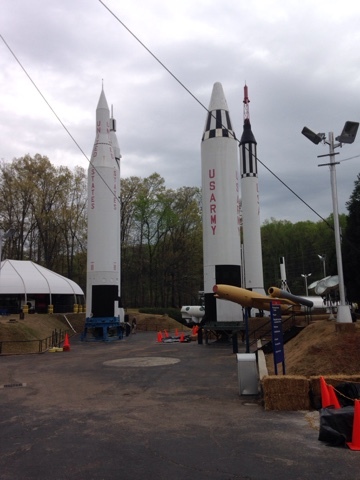 Next we were taken to one of the original missle testing sites. 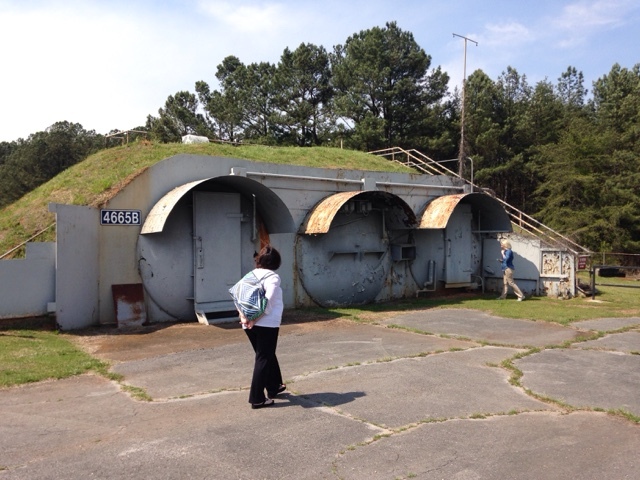 Here are the homemade bunkers from tank cars for monitoring the tests. We viewed other sites and were provided additional information and chance to ask questions. 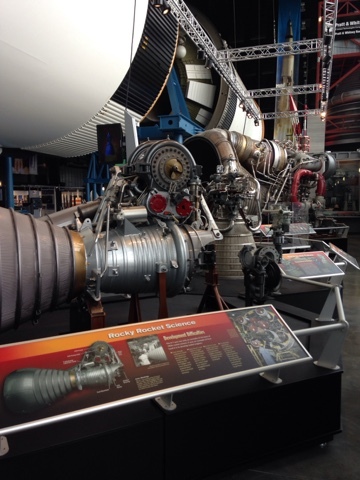 I had a side conversation with our guide about nuclear space transportation as I had recently been to the National Nuclear Testing Museum in Las Vegas and had seen a display on the Nuclear space rocket program. We eventually got to a site where the nuclear rocket was to view and he wanted me to speak to the bus. I gave a brief overview of the Museum in Las Vegas and what I had learned using the PA on the bus. We returned back to where we picked up the bus after this 2.5 hour tour, which was excellent. Knowing that if I had time for only one thing I would take this tour. 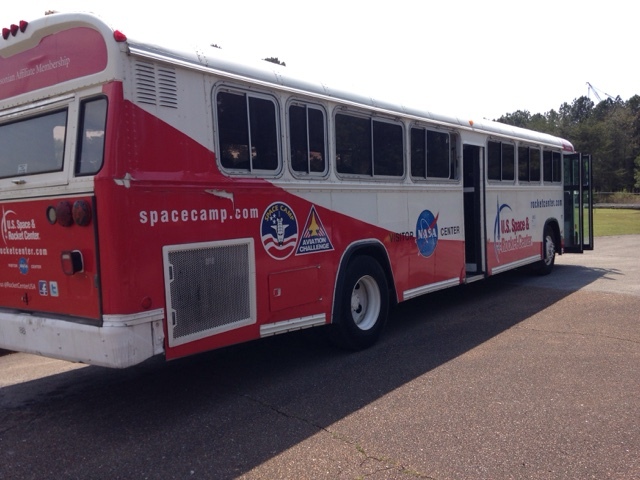 The guide on the bus did explain the reason for blocking off the parking lot and that was for the rover challenge where schools all over come and compete with their rover vehicles doing all kinds of things. They have to meet certain standards and do certain things. 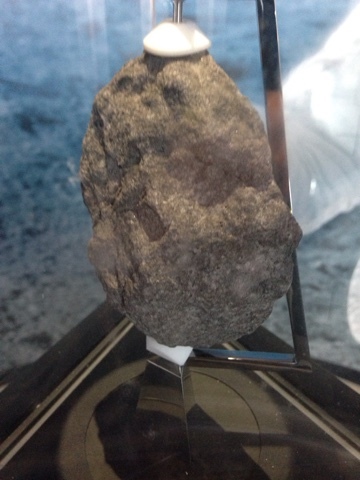 I returned to the National Geographic building where this moon rock (above) is located. I also played with the interactive displays that were occupied before. One example was the loner lander. Yea! I didn't crash the first attempt. I then walked over to the first building to those halls near the cafeteria. There was an interactive display for landing the shuttle. I scored again by not crashing the shuttle on the first attempt. It was time to head back to the GTG and I still needed to stop and do laundry. 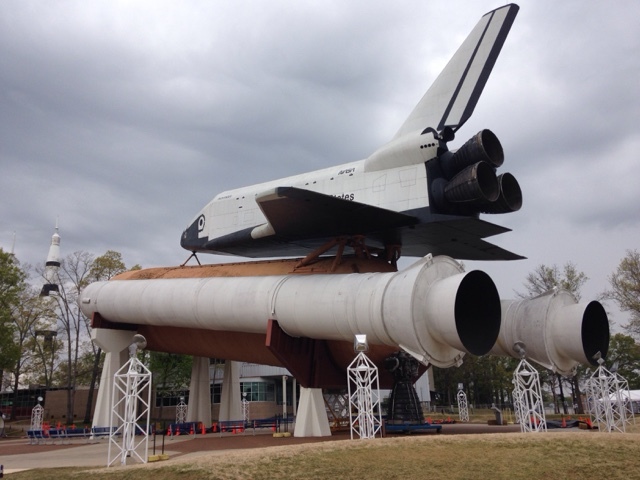 I left with mixed feelings about my visit to the Huntsville Space Center. The bus tour was great and I would highly recommend it. I didn't have time for the IMAX theater so I can't say how this was. Possibly my expectations were too high from all the years of waiting to go. I think if you have 7+ aged children they would have fun. There isn't much for real young children.